So your insurance adjuster told you that you have roof damage and recommended that you replace your roof. 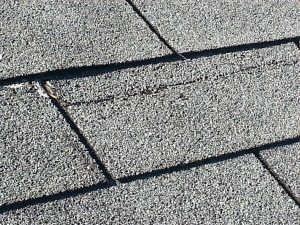 You cant see any damage, you don’t have a leak, and you have any excess shingle granules in your gutters or on the ground. So you called a local roofer to try and confirm that your roof is damaged. The roofer confirmed that your roof needs to be replaced. What could they be seeing that indicates to them that you need your roof replaced? 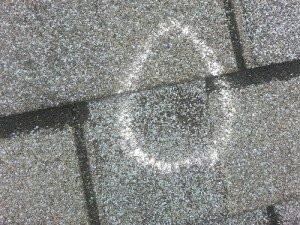 One of the most difficult types of roof damage to identify is hail damage. Hail damage comes in many varying degrees of severity. Not all hail damage warrants roof replacement but in nearly every situation it will shorten the life expectancy of your roof and potentially void the warranty. The common rule of thumb for measuring the severity of hail damage is by testing a 10×10 area of each slope on your roof. If 8 or more hail impacts are found in the 10×10 tested area, replacement is the normal recommendation. The type of roofing product on your roof will have an effect on how hail impacts the functionality of your roof. Wind damage is normally easier to identify than hail. Wind damage is also more easily repaired than hail damage as often times it will be isolated to very few shingles. Like Hail damage, Wind damage has varying degrees of severity. Often times when the wind has lifted a shingle and creased it, a leak will follow shortly. Below you will see an example of typical wind damage. As with hail damage the type of shingle product you have will have a baring on how well your roof will withstand high winds. All roofs have a life expectancy. When a roof has reached the end of its life expectancy you will begin to notice bare spots in the middle third of the shingle. You will also notice significant granular loss in your gutters and sidewalks. As a roof ages it will become more susceptible to storm damage. Wind ratings decrees with age and the ability to make lasting repairs can become very difficult. Hail can also wreak havoc on older roofs. As the granules fall off of the shingle so does its protective layer. When the fiberglass matte is exposed the shingle becomes very subject to damage via impacts from hail or limbs. Rubber boots are normally used to seal vent pipes protruding through a roof. These boots have about a 10 year life span and will need to be replaced at least once during the life span of your roof. When your pipe boots rot a leak is not far behind and this is the most common source of leaking roofs in Columbia and Lexington SC. At the end of the day your roof protects your family from the elements and finding a local Lexington roofer or Columbia roofer will keep your roof in tip top condition for many years.